The present Monastery of Sao Vicente de Fora dates back to the 16th century, when King Philip II of Spain (King Philip I of Portugal) ordered the reconstruction of a former place of worship built by order of King Afonso Henriques in the 12th century (1147), as a fulfillment of his vow to erect Christian churches on the sites where crusaders died during the war against the Moorish dominion. The construction works took several decades, such that the monastery was inaugurated no sooner the 1629. Major restoration works were carried out subsequently to the 1755 earthquake, when the roof collapsed, just as the main dome did. In the mid 19th century, the Church became the burial place of the members of the royal Braganza family. 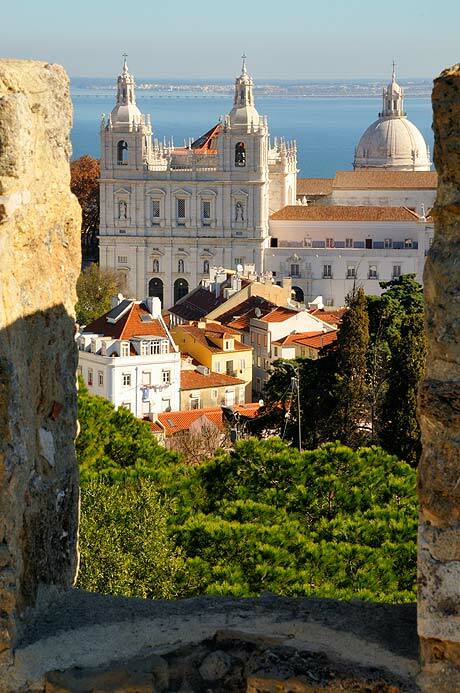 Architecturally speaking, the monastery is deemed one of the finest mannerist buildings in Lisbon (and Portugal, for that matter). Romanesque features are, however, prominent, both inside and outside the edifice, but the eclectic feel one can get while visiting the church is quite strong, mostly because several architects contributed, in time, to the patrimony of the monastery (and of the church): Filippo Terzi (an Italian Jesuit), Juan de Herrera (Spanish architect), Leonardo Turriano, Baltazar Alvares (author of the façade), Pedro Nunes Tinoco, Joao Nunes Tinoco. Highlights refer to an altarpiece by Joaquim Machado de Castro, one of the finest Portuguese sculptors in the 18th century, to the paintings on the ceiling of the monastery (work of Vincenzo Baccarelli), and to the cloister murals depicting scenes of La Fontaine’s fables.